I have been looking for a modern Smartwatch since last few months and heard a lot of positives about Kospet Hope 4G Smartwatch Phone. 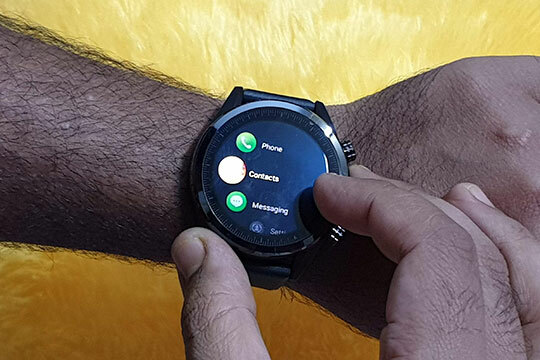 Previously I have also written a feature review of this smartwatch phone on our blog. Finally, I decided to purchase it and I ordered it through GearBest at a price of $139.99 with a hefty discount of 23%. 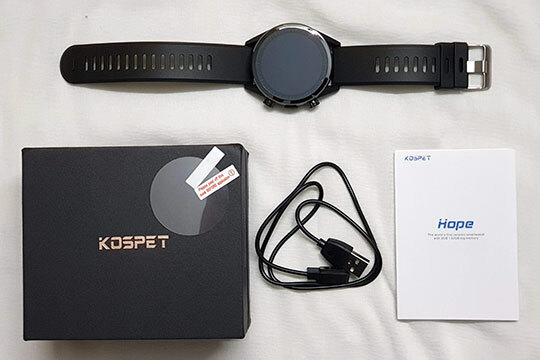 I received Kospet Hope 4G Smartwatch phone via DHL packed in a nice black square box having a detachable lid. There were a couple of cardboard sections in the box where accessories are stored safely. The package contains the main device, charging cable, screen protector and user manual that made me well acquainted with all the features of this magnificent device. I have also scanned the user manual and uploaded it so anyone can download and check it. You can download it from here. When I held this masterpiece in my hand, it made me so excited that I couldn’t resist myself from sharing some of the pictures of it on my social media accounts. Recommended for you: Vivo NEX Dual Screen / Dual Display Smartphone Feature Review. 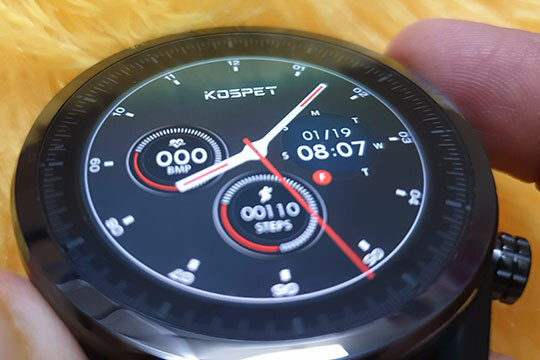 I don’t see anything exaggerated about the design of Kospet Hope 4G Smartwatch and it looks exactly similar to the way it has described. The perfect combination of ceramic and metal material has enhanced its outer appearance. After few touches, I could easily feel that high-quality material has been used while manufacturing this device. It is a durable gadget that can withstand critical situations and you can completely rely on it to get your job done. The amazing thing about this smartwatch is that I can use it for both business as well as casual purpose. The long end of smartwatch strap measured 125mm x 24mm while the short end measured 98mm x 24mm. The strap is smooth to remove and it has got 10 tick marks for wrist adjusting purpose. I found the silicone strap very comfortable for both indoor and outdoor activities. What this means that I can save a cost of buying additional smartwatch as I can use Kospet Hope for different occasions such as business conferences, wedding functions, sports meet etc. This is what makes me fall in love with this device for all money and I can carry it whenever I want with high proud. As mentioned in the product description, I found this smartwatch extremely light-weighted and even after holding it around my wrist for a whole week; I couldn’t feel anything arduous. 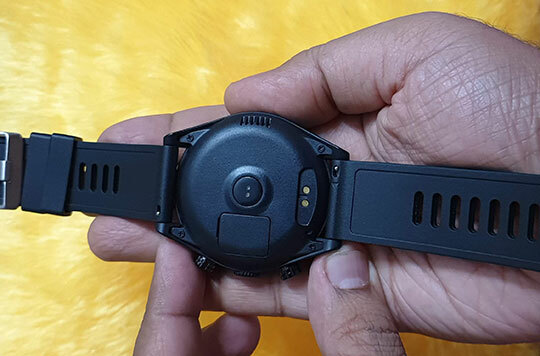 I found AMOLED display of Kospet Hope 4G Smartwatch extremely precise in size (1.39 inches) and it allowed me to get a clear look of timings even after a quick glance. I could also create my own watch face and I can use all my creativity to make it look the way I want. The display of Kospet Hope features physical as well as touch control. The dual control system allowed me to use it conveniently in different weather conditions. On the back side of this smartwatch, you will find a heart rate sensor which has played a vital role in keeping track of my everyday health activities. The default brightness of the display was quite normal and the effect was dying in the sunlight. With small customization, I can achieve perfect brightness on my device. 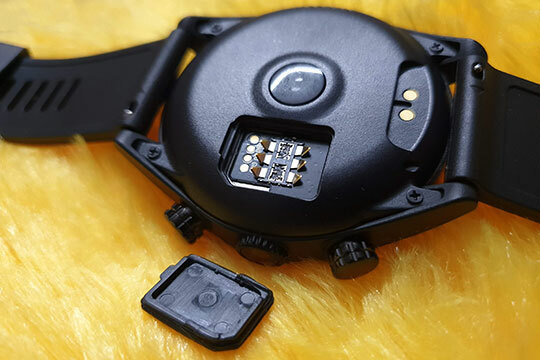 The ‘Back’ and ‘power’ buttons of Kospet Hope 4G Smartwatch are extremely delicate and comfortable to use. Even after the mild push, I can achieve what I wanted to get with those round buttons which are precisely placed at the right side of the device. The buttons are extremely smooth and I could perform quick navigation without any discomfort. I don’t think designers of the device can do a better job than this as they have already achieved a lot of perfection in keeping everything in the right place. Even if you don’t have any technical experience of the smart watch before, you will find Kospet Hope extremely comfortable to use. I found the interface of display extremely user-friendly and I can easily access device settings by simply swiping down. I can scroll and access the entire navigation menu to take total control of this device. 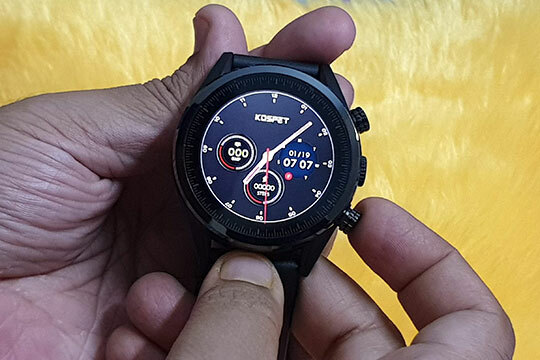 Kospet Hope 4G Smartwatch features 3GB of RAM and it also gave me ample storage. The 32GB of ROM has taken care of all my media files and I don’t need any external support to enhance my storage. The MTK6739 quad-core processor has powered this Smartwatch while Android 7.1 OS has played a vital role to enhance its functionality. I could access Google play store to install social networking apps such as YouTube, Facebook, Instagram, Twitter and much more. The 8MP camera is extremely handy on this highly compact device as it allowed me to capture quality images wherever I go with only a few clicks. Though a battery of 620mAh looks tiny when compared with smartphones, it can create miracles for users like me. When compared with other Smartwatches, I found the battery of Kospet Hope 4G extremely strong. It took me only an hour to charge the battery completely and I can use it for the whole day with a single charge. As expected, I found batter of this device draining quickly when GPS, Wi-Fi or 4G data function is turned on. I researched online about this product prior to buying it and I was well aware of its common and unique features. After inserting my Nano SIM in the Kospet Hope 4G Smartwatch, I was all set to unravel its wide range of features. The smartwatch is equipped with a common feature called ‘raise the hand to wake up’ which I could turn on or off at my own will. This function came extremely handy for me as I don’t need to press any keys to switch on the display and I can do it with mere gestures. However, Kospet Hope 4G doesn’t possess another common feature – ‘lower hand to turn off screen’. I found this functionality in most of the other smartwatch and it is extremely handy at times. I was a bit surprised by the fact that being such a premium device, Kospet Hope 4G Smartwatch doesn’t have this facility. As far as connectivity is concerned, I didn’t face any trouble pairing this smartwatch with my Smartphone. I have activated Bluetooth on both the devices, opened the application and within a few clicks both the devices were paired. I could see all the notifications on the watch regularly and this is something I found extremely convenient. It is one of the reasons why Kospet Hope 4G can act as a perfect replacement for my smartphone. It is nicely optimized that makes sure you don’t face any hangs that lead to call interruptions. I didn’t see dials getting warmed even after using this device for longer sessions. 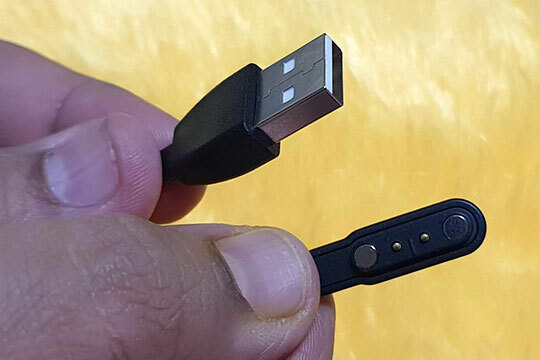 During last week, I was travelling for a couple of days and I thoroughly enjoyed listening to music on this device by connecting it to my wireless earphones. Though this Smartwatch is equipped with waterproof functionality, I will not recommend wearing it while in the swimming pool. However, it can easily resist weather conditions emitting a lot of moisture or dust particles. Being a sports personality, I found Kospet Hope 4G Smartwatch extremely helpful. The heart rate and steps count features offered in this device took care of my important fitness activities. I discovered several sports modes in this device such as jumping rope, basketball, football, cycling, running, walking and much more. Some other common features I discovered in this device are – caller ID, push notifications for applications, reminders, alarms, stopwatch, sound alters, vibrating alert, instant SMS display, accept or reject incoming calls etc. It is only a week and I found a lot of things to talk about this device. I am confident that in the coming time, I end up discovering something magnificent about this remarkable smartwatch. You may also like: Xiaomi Mi Mix 3 Smartphone Feature Review – All You Need to Know. Kospet Hope 4G Smartwatch Phone somewhat change my perception towards gadgets that offer multitasking. Earlier, I only believed in purchasing products which are known for offering dedicated service. But this smartwatch is loaded with the amazing specification that can’t be overlooked. When compared Kospet Hope with other devices that fall in a similar category, I found several reasons why it can stand out in the competition. There are many smartwatches that are blessed with outstanding design while others are focusing on important parameters such as performance. I found Kospet Hope 4G excelling in all aspects and this is what made it a versatile device of today’s time. All in all, I rate this smartwatch as a complete value for money product and users like me will definitely enjoy using it to its full potential. I found Kospet Hope 4G excelling in all aspects and this is what made it a versatile device of today’s time. All in all, I rate this as a complete value for money product and users like me will definitely enjoy using it to its full potential. Bought and received it and was total dismay. The battery drains very very fast (like 1% per minute). Turning the battery saver on also doesn’t help. The screen is too small to type and almost impossible to navigate through eg WhatsApp. I bought this just in case I run outdoor and no need to bring my phone. All the running apps (Runkeeper, Runtastic, MyFitnessPal) were not compatible except for Strava and yet the GPS cannot function. I have a sim card inserted in it. I only installed the important apps such as Spotify and WhatsApp. Facebook was installed because it was linked to my Spotify account. Had updated the software but the problem persists. Please do not expect a smartwatch phone will replace your smartphone. But you can compare it with any other smartwatch or smartwatch phone. On my device, the battery backup is quite adequate and it generally lasts for a day with moderate usage. This smartwatch doesn’t support Bluetooth call. Considering it supports LTE, there is no good way to answer the call without Bluetooth calling functionality. Actually, this is a smartwatch phone. You can insert a SIM card on the watch itself. You can also connect Bluetooth headphones for incoming and outgoing calls.